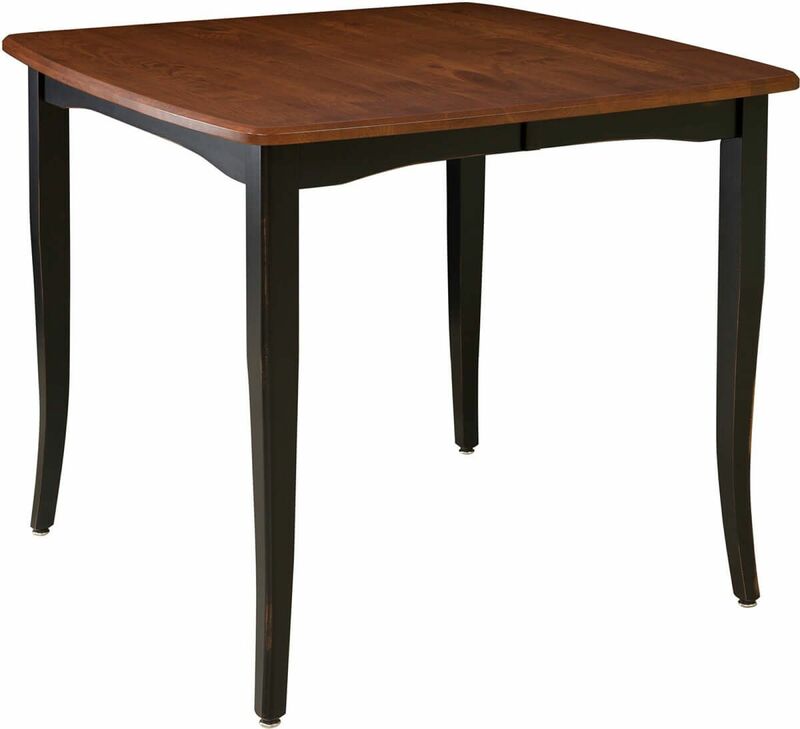 Tall and regal, our La Motta Cafe Table offers an elevated dining experience for casual or formal meals. Order yours using the options menu below. Discover the exhilaration of designing a custom conversation piece with the La Motta Cafe Table. To order as pictured, choose a Cherry top and Brown Maple base. Our La Motta Pub Table, however, can also be tastefully informal if you choose. All leg options feature adjusters in the feet so that you may secure a level eating surface. Further, you can create an eclectic space with your La Motta Cafe Table by choosing a stain that matches your current decor, or one that functions in contrast to it. Built by Amish craftsman, your pub table top is a substantial one inch of genuine American hardwood. We use no fillers, veneers, or plywood in creating your custom La Motta Pub Table. As shown in a 42" solid top, this dining peak seats four. The addition of two leaves, at your request, increases seating to six. Leaves are constructed of solid hardwood and extend on wooden slides that will function effortlessly for generations. Everything about the La Motta Pub Table is made-to-order to your specifications. Because our Amish artisans sand and finish each dining table by hand, you can be assured this exquisite piece will bring you a lifetime of memories. *Dimensions do not include leaves. Each leaf adds 12". **Table height is 36" or 42".